I have always worried about things rusting. I mean, you buy shiny new metal items and you want to keep them that way, right? Not necessarily. Honestly, if something has turned rusty, there are a number of ways to clean it or you could just use it as lawn and garden décor. Rusty items as lawn décor? Yes! And, the rustier the better. 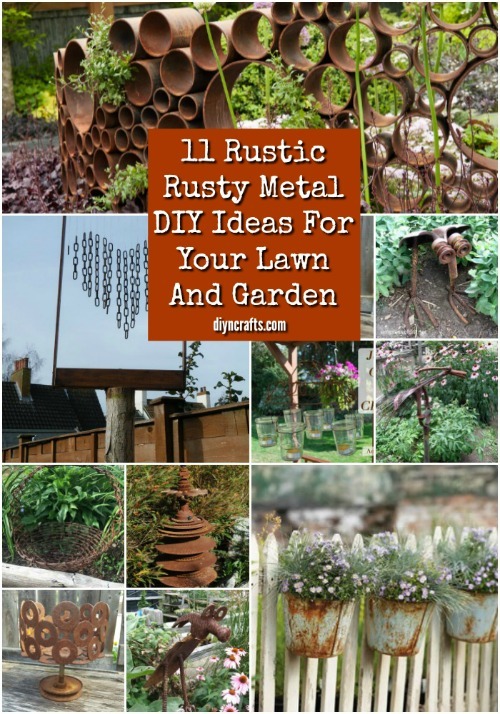 Rusty metal items give you such beautiful rustic inspired décor and I have a list of 11 rustic rusty metal DIY ideas that you can incorporate into your lawn and garden today. If you have been trying to turn the outside of your home into a farmhouse inspired exterior, these rusty metal DIY ideas are definitely going to help. The rust on old metal items really does give it a rustic look and I have everything in here from metal windchimes to bucket planters and even some great fencing ideas. Note that these are everyday items. 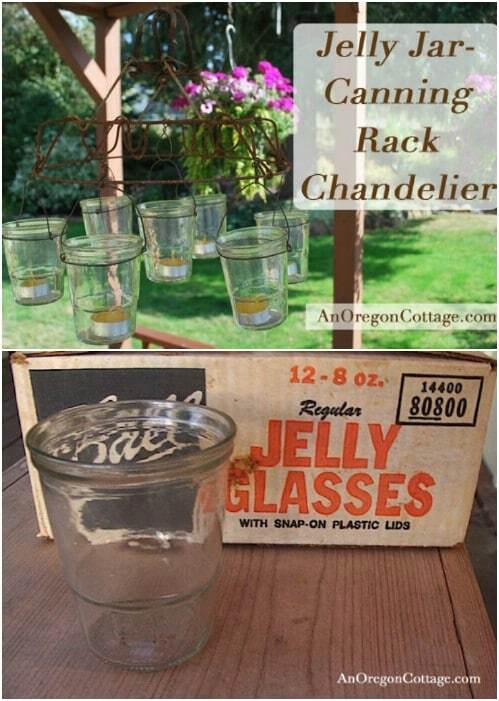 If you are looking for old gardening tool projects, I have a list of 25 DIY repurposing ideas for old garden tools, too. If you want to give your outdoors a great farmhouse look, these rusty metal DIY projects are definitely going to help you with that. There are so many great projects in this list and all of them are made with old metal items. That means that they are really budget friendly to make. If you don’t happen to have the rusty metal item that you need, check yard sales, flea markets and even your local thrift store. These things are normally really cheap since they’re old and rusty. You are the only one who will know how priceless those items really are! And, if you love repurposing projects, take a look at these 20 genius ways to repurpose five gallon buckets. 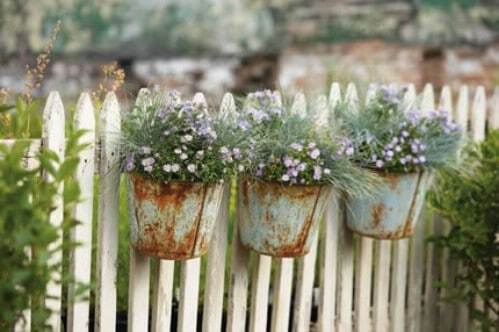 Now, start gathering up that old rusted metal – we’re going to make some gorgeous outdoor décor! 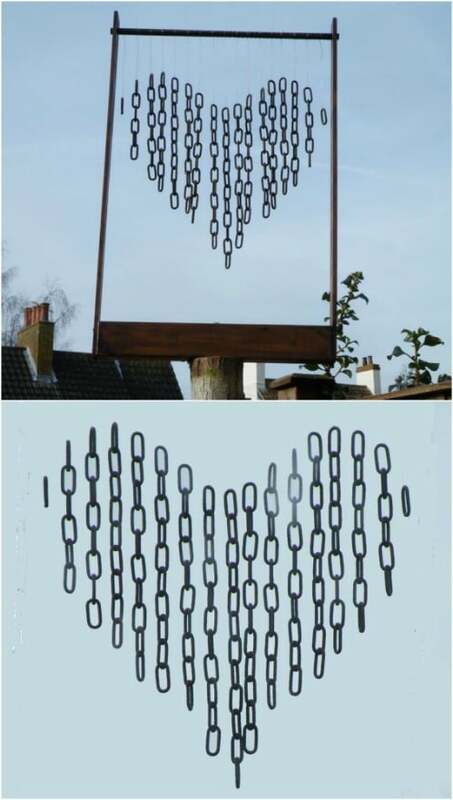 An old rusted metal chain can be used to create a gorgeous rustic windchime. You can do this in the shape of a heart or any shape that you want. You just need the chain and some rusted metal or wood to create the frame to hand your windchime. This would be great in a horseshoe shape if you want a nice farmhouse themed windchime or you could be really creative and make a monogram out of it. DIY windchimes are really easy to make and so beautiful when they’re finished. You know those little rusty metal buckets that you are planning to throw out? Keep them! You can make these gorgeous hanging bucket planters from them. You don’t even have to repaint them or sand down the rust. The rust just adds to the rustic quality. All you have to do is create hangers for them on your deck or fence and then add in your favorite flowers or plants. 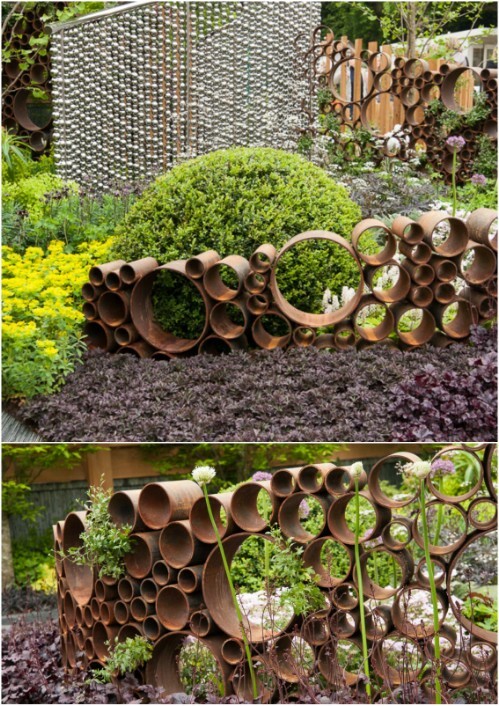 If you have a few old rusted cylinders or pieces of pipe, you can use them to create this gorgeous rustic fence. You just stack the pipes on top of each other and if you have different sizes, that will just add to the charm. This would be great to add a focal point to a flower garden or you could use it anywhere that you want to add a bit of rustic charm. This adorable flower pot is made from old rusted washers. You can do this yourself with a few washers of different sizes and something to use for the base. Or, you can check out this gorgeous one that I found on Etsy. It’s made with all repurposed materials and you can get it for just under $40. This is perfect for highlighting your favorite blooming plants and it’s already rusted, so you can sit it out in the garden without worries of the weather harming it. If you don’t have a collection of old rusted wheels, you can get them at any flea market and most thrift stores for just a few dollars each. 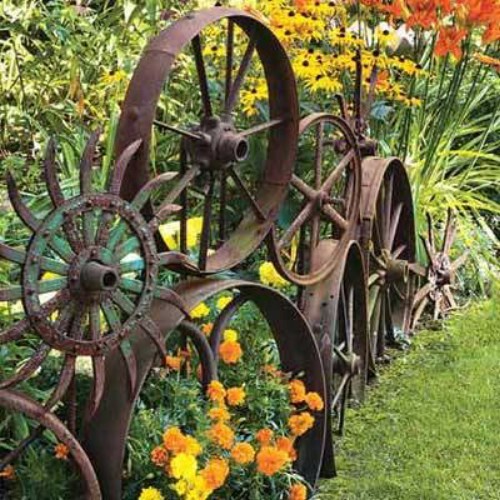 Once you have them, you can use those rusty wheels to create a gorgeous border for your flower garden. This has such a nice rustic appeal and it is super easy to put together – not to mention a really cheap DIY garden edging idea. Some old glass jars, a few pieces of old wire – it can be rusty, too – and an old rusted canning basket are all you need to create this gorgeous farmhouse inspired outdoor chandelier. The rusted materials give it the perfect rustic look and this one is super easy to put together. You can make this with things that you probably have on hand already, so this one is also really cheap to DIY, possibly even free! A rusted old milk can is the perfect base for a rustic looking birdbath. You don’t have to do anything to the milk can – the more rusty it is, the better. You just add a top that holds water for the bath section and then sit this in the garden so that your birds and your neighbors can admire it. Add it next to your DIY bird feeders to create a nice little birdie paradise in the garden. 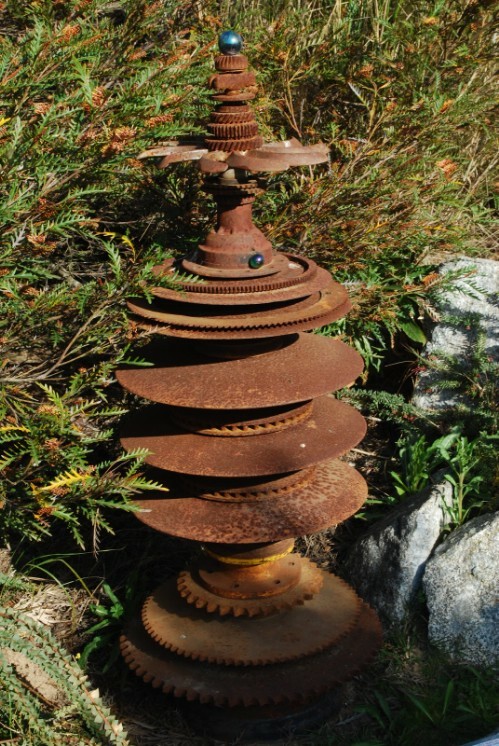 This “tree” is made from old rusted discs, like old brakes and other items that are circular in shape. You just stack them on top of each other and weld or even glue them together. Use discs in different sizes to get a really unique look or if you are looking for some great outdoor DIY Christmas décor, you could start with larger discs on the bottom and work your way up to smaller ones to create the shape of a Christmas tree. 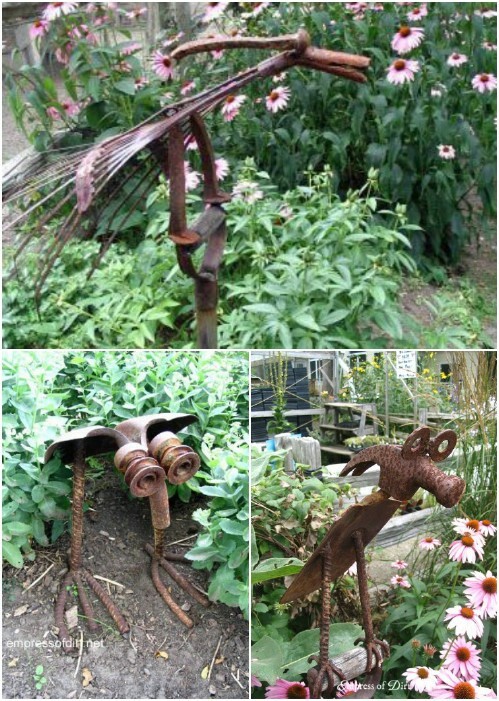 Turn those old rusted tools into adorable garden animals and sculptures for your yard. There are so many possibilities with this DIY project. Whether you want a bird made out of hammers or one made of shovels, these are really simple projects and they are all adorable when they are finished. This is the perfect DIY rustic décor to add some farmhouse flair to your flower garden. These flowers are perfect for decorating your outdoors. Not only do they have a great rustic look, they will never wilt or die! 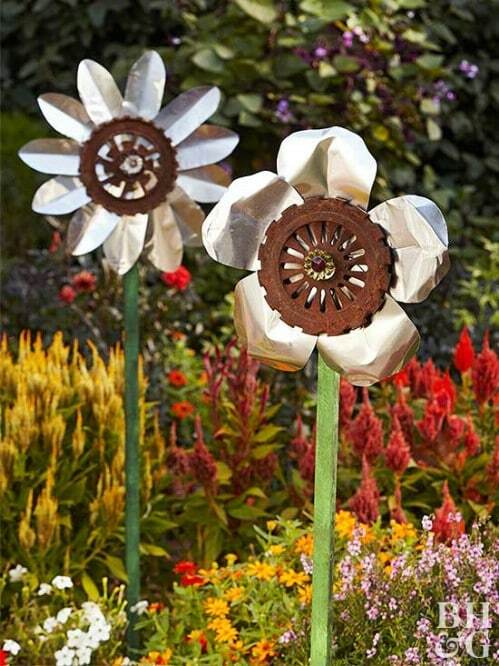 You make these with old rusted discs, cut sheet metal and a decorative doorknob which doubles as the flower’s center and the base that holds the entire thing together. These are gorgeous for the front yard and they are so easy to make. I found this gorgeous rusted barbed wire basket on Etsy for around $85. It’s perfect for adding some flair to your garden or you could have it on the porch with your favorite potted plants. You can make this one yourself if you prefer, but you need to be careful if you are working with barbed wire, especially rusted barbed wire. You can just as easily buy this one from Etsy. These would also make gorgeous DIY hanging planters.